Just got back late this afternoon from a trip over the mountains into the eastern part of the state. We spent two nights on the outskirts of Leavenworth, two nights at a gorgeous campground run by the local electric utility on the east bank of the Columbia River near Lake Chelan, and one night at a CG near Winthrop, on Lake Pearrygin. Photos to follow in the next couple of days. Thanks, Peter, it was an enjoyable trip. As we approached Leavenworth, a forest fire had just started along the edge of the road. We met the response team a bit further down. It was a bit scary to see a 120-ft fir tree ablaze from bottom to top just 10' away from the road. It was very hot in Leavenworth, which made wandering around a bit difficult Our outdoor min/max thermometer showed the max for Mondy was 116 F. The transducer was in the shade of the awning. 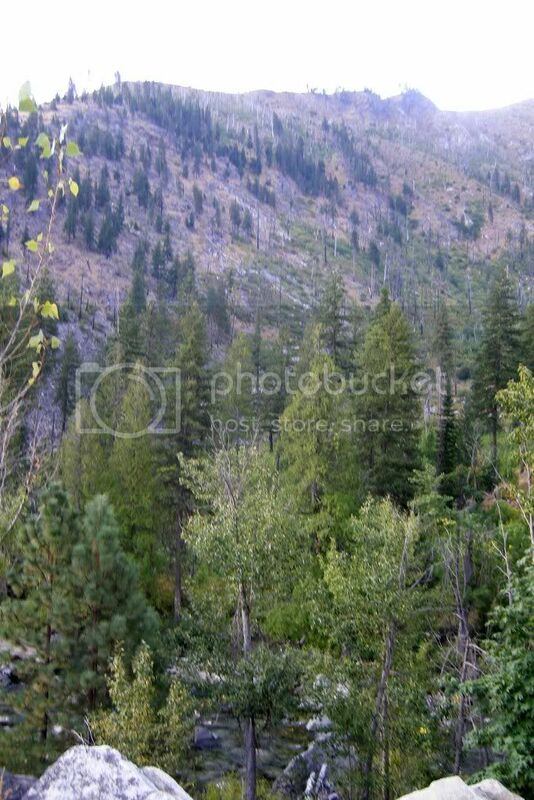 Chelan was cooler - mid 90's, but that's much easier to live with when you're in a spacious camgpground with lots of shade trees and grass, rather than the exposed, gravel-surfaced cliff-top site we were on in Leavenworth. The temp in Winthrop was a surprise, mid-70s, sunny and with a pleasant breeze. Tha CG was reasonably spacious, but the interior roads were gravel and very dusty. We did just under 400 miles for the trip, going over a 5500' mountain pass on the way home the last day. Horsing a 10-ton, 32-foot motor-home on the downhill side was tiring - the roads are quite narrow. The motorhome performed well, better than 7 USmpg, no overheating on the long slog up Washington Pass despite having the a/c on. Haven't unloaded the camera yet, so pics will be a day or two. 7mpg? Glad to see you're being responsible with the planet. The average supermarket truck does better than this and feeds communities for a week! I follow the English guy (Daily Telegraph Motoring page, I think) that said "the quicker we burn off all the fossil fuels, the quicker the powers that be will figure out an alternative". At 7 mpg. I'm doing my part!!! It's better than the 5 mpg I got with our last RV. 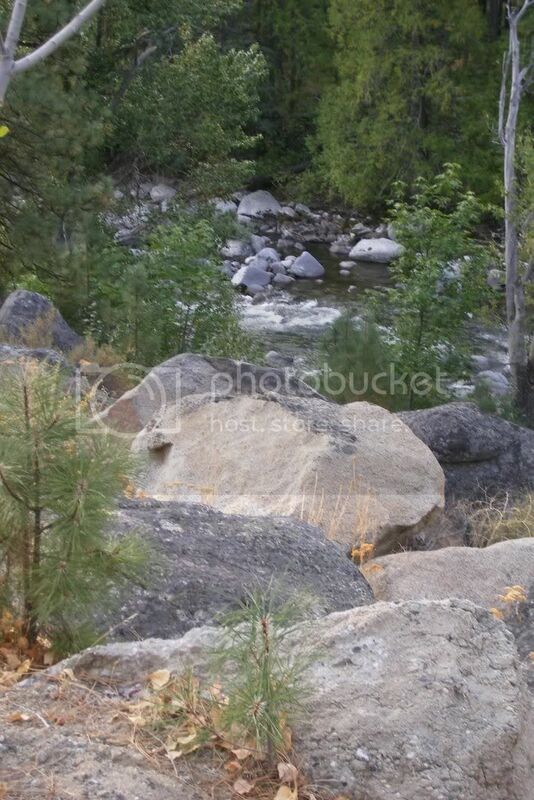 The first photo below shows a view across the Icicle River gorge from our campsite, looking up about 15 degrees. The two rocks in the foreground are about 5 feet from the front bumper! I figure the top of the ridge is about 400 ft above our campsite. The second pic is looking down towards the river from roughly the same place. It's maybe 250' down. When we got about 5 miles from the turn-off from US2 to the campground we came across a forest fire, right along the edge of the highway for about a half mile. It had started in the grass and lower vegetation, but there were a couple of 125 foot fir trees ablaze all the way to their tops. Scary stuff. Mor photos of our other two stops in a day or two. More to come later this week, Linda. It's been a bit hectic the last few days.